To get your accepted paper published in the conference proceedings, each paper requires one author registration. On the other hand, a student registration does not cover the publication fee, i.e., even if all the authors of a paper are students, an author registration is required. 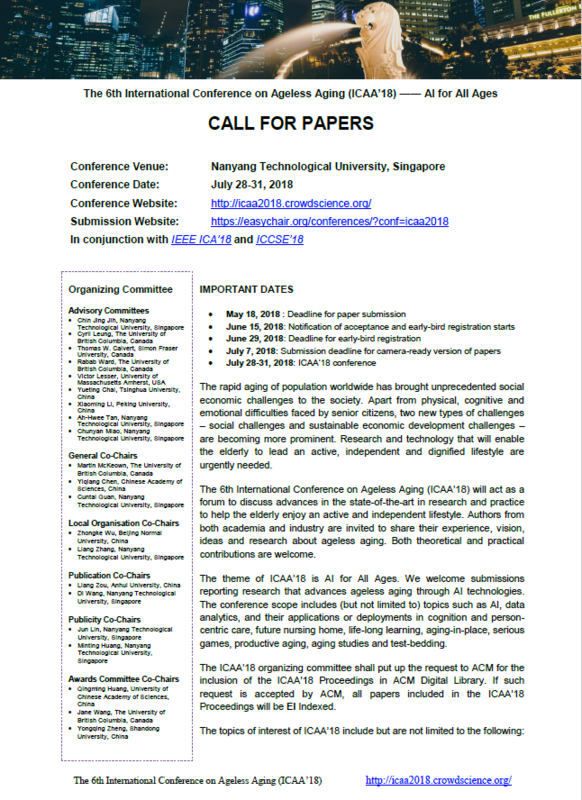 If you encounter any problem with the registration or want to make an enquiry, please write to icaa2018@crowdscience.org. (PAPER ID refers to the unique ID assigned by EasyChair. It is optional if the attendee does not need to cover the publication fee of any paper. Multiple registrations in one transaction are encouraged. However, please do indicate all the paper IDs in the Reference section during wire transfer and send the comprehensive information via email afterwards). Cancellation of any paid registration is only refundable if your visa application to Singapore is unsuccessful by 27 July 2018. In such unfortunate cases, if you are able to provide sufficient and relevant supporting documents, the organizing committee shall refund your registration after the conference. However, an administrative fee of $80 SGD will be applicable. Moreover, in case the full registration covering the publication fee of a paper is refunded, this paper will no longer be included in the conference proceedings.